The Dave Clark Five lead singer Mike Smith died of pneumonia Thursday February 28, 2008, less than two weeks before the band was to be inducted into the Rock and Roll Hall of Fame. Mike became 64. Mike Smith died at the Stoke Mandeville Hospital north of London. He was admitted to the intensive care unit Wednesday morning with a chest infection, a complication from a spinal cord injury that left him paralyzed below the ribcage with limited use of his upper body. He was injured when he fell from a fence at his home in Spain in September 2003. Mike had been in the hospital since the accident, and was just released last December when he moved into a specially prepared home near the hospital with his wife Charlie. All songs are written and produced by Andrew Lloyd-Webber and Tim Rice. On the cover and the enclosed booklet is printed that Smith & d'Abo play the role of Dolan Getty & sidekick in the song "A New Argentina", but they are also the officers 1 & 2 in "Rainbow Tour", which, in my opinion, is one of the best songs of this double album. Vocals on "Who's Counting On Me" by Smith & d'Abo, while the song was written by Eddie Hardin. Other artists on this album are: Ric Lee, Roger Glover, Jon Lord, Rick van der Linden, David Coverdale, Glen Hughes, Tony Ashton, Chris Barber Band, Eddie Hardin, Pete York, Ray Fenwick, Jimmy Helms, Mark Nauseef, Leslie Binks, Henry Spinetti, Mo Foster, Mike Smith & Mike d'Abo. From these names we will find Jimmy Helms later back in the musical "Time" by Dave Clark, while Mo Foster also played in the band of Smith & d'Abo. Also many Deep Purple and Spencer Davis Group members are involved in this album, however the music isn't hardrock but more easy listening, especially the Smith & d'Abo song "Who's Counting On Me". In December 1979 I visited Mike Smith and asked for more details about this album, but Mike didn't even know it was released, and asked me if I could get a copy for him, which I did. He could remember that he and Mike d'Abo were in the recording studio when someone asked them to sing in a song, but never knew it was put on a record. They probably liked the song as much as I do. On the cover is a small picture of the two Mikes looking at a sheet of paper with probably the music and lyrics. Mike d'Abo gave me this album when I visited his home on October 31, 1997. This album has the same tracks as the album "Wizard's Convention" only the albumtitle was changed in the songtitle of one of the tracks. Probably President records bought the rights of this album, but then it's a bit strange to see Repertoire Records release this album on CD with the note "Made under license from Eddie Hardin". I'll try to inform at President Records about this puzzle. This 2CD set has been released in 1993. Among the tracks of the "Wizard's Convention CD is the song "Who's Counting On Me" with vocals by Smith & d'Abo. The single "Butterfly Ball" was a hugh success in Holland, probably through the cartoon clip that accompanied the song. Later (in 1985) Paul McCartney made a similar clip to his song "We All Stand Together". Repertoire Records "leased" the "Wizard's Convention" albumtracks from RCA Records, added 6 new tracks (tracks 12-17) and released this CD in 1994. It's good to see the song "Who's Counting On Me", with Mike Smith and Mike d'Abo on vocals, on a CD. Still it's a bit strange, that this CD has "p - 1976 RCA Records", while the 1985 album "Money To Burn" has "p - 1976 President Records". Who's able to solve this "problem". The front cover of the CD has again a lot on small pictures, but however Smith & d'Abo were on two of them on the album cover, they are not on the cover of the CD (shame on you Repertoire Records). Twenty years after the first Wizard's Convention album, volume two was released, with again many well known artists like Chris Farlowe, Snowy White, Ray Fenwick, Mo Foster, Chris Thompson. This time no Smith & d'Abo song, but a duet of the two Manfred Mann singers Mike d'Abo and Paul Jones. For further details about this album, see the Mike d'Abo solo part of this book. The album and/or cover don't differ from the UK release, only on this one is printed "Made In Holland". 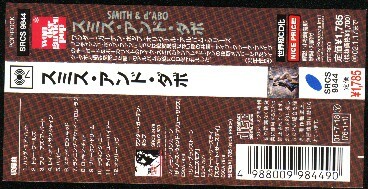 However I'm very happy with the release of the "Smith & d'Abo" CD, I hoped that there would be one or more bonus tracks on the CD, because that often happens in Japan. At the other hand the CD had something extra above the album version: like with all Japanese releases it has the full lyrics in Japanese, but also in English. CD, it should not be too difficult to find it. This is (as far as I know) the only record besides the official "Smith & d'Abo" records, that has a Smith & d'Abo track. The album has a white cover with a sheet sticked on the cover which tells which songs are on this record and from which albums they are taken from. It also says "Promotional use only - NOT FOR SALE". The same information can be found on the white label. However the mentioned catalogue numbers are the U.K. ones, I think it's a U.S.A. release for DJ's use. in the Spanish language on the album cover and label. Smith & d'Abo Live at The New Vicoria, London November 5, 1976. A good friend of mine from England, George Rowden, illegally taped the very last concert Smith & d'Abo gave.This was at the New Victoria in London as supporting act of Sailor, with whom they toured Germany, Austria and England. The show was taped with a cassette player, but the sound quality is surprisingly well. You can hear the words of the songs very good, and also the chats between the songs. Ray Of Sunshine: This song starts with a one minute and 10 seconds instrumental part, probably to warm up. This powerful intro sounds fantastic, and is one of the best parts of the tape. "Ray Of Sunshine" sounds very much the same as on the album. Especially the drum is great. At the end Mike d'Abo says that this is their new single released today. Take You Higher: Mike Smith does the vocals on this song, and he sounds as well as on the record. Also here is a different guitar solo than on the LP. Two Worlds: Smith & d'Abo singing a great duet which sounds fantastic, that it makes me wonder why they didn't sell well, and why they had to break up. The Mighty Quinn: During the intro of this song, Mike d'Abo is telling the audience that Mike Smith once was a member of the Dave Clark Five, and the audience then start shouting and clapping. I've heard many versions of "The Mighty Quinn" but this is certainly not the worst one. Mike d'Abo has the lead vocals, and especially the last chords with the sudden ending are really great. A Broken Dream: Another ballad with Mike Smith again in the lead, and what a voice he has. Also the band is playing great, and the big applaus proves that the audience likes it too. Rockin' Chair: A song in which the two Mikes sing together very well, and now and then they seem to have a duel with their voices. Free As A Bird: Someone in the audience shouts for "Free As A Bird". It's announced as their latest single. Mike Smith must get very high with his voice, and again it's no trouble at all. This is probably the best song they do on this tape. At the end of the song, Mike Smith thank the public they met during their tour. Then they introduce the rest of the band with Mo Foster on bass; Barry de Souza on drums and Ray Russel on guitar, so the same musicians as on the Smith & d'Abo album. Skid Row Kid: The two Mikes and the band make this song much more powerful that on the album. It even sounds heavy, especially the guitar. It is known, that "Glad All Over" was played occasionaly too during the tour with Sailor. Unfortunately they didn't play it at their very last concert. For the real Dave Clark Five fans it would have been something special. "The new Smith & d'Abo team opened the evening to an unusually warm response for an unknown act - so much for reputedly inhibited German cloth. Mike Smith was in fine voice. Mike d'Abo is still an engaging pop writer, and the pair's double leads on keyboards and vocals in front of supporting guitar, bass and drums make for a combination with interesting potential." That's not bad, but the record buying people probably didn't read this article and that's a pity. 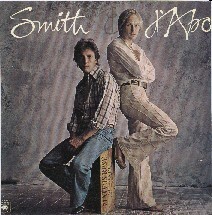 Smith & d'Abo songs by other artists. The a-side was written by "d'Abo/Smith". This is a bit strange, because on all other occasions you can read "Smith & d'Abo" as composers, just like their album title. This must be one of the very first songs Smith & d'Abo wrote, because 1976 saw the release of their album. It's a pity I don't know more of this release. "Ray Of Sunshine" is a song written by Smith & d'Abo and is one of the tracks from their one and only album. "Jenny" is a song written by Mike d'Abo/Mike Smith/Noel d'Abo. Both sides of the single are produced by Kingsley Ward and co-produced by J. Buckingham. The b-side of the single "Gang Man" is written by Brian Trusler. Further on there's nothing known about the record and or group. This song hasn't been released by Smith & d'Abo themselves. The third cover of "Ray Of Sunshine" written by Smith & d'Abo, and taken from their album. A copy of this New Seekers album was given to me by Mike Smith when I visited him in December 1979 in his London apartment. The reason that The New Seekers recorded the Smith & d'Abo song "Ray Of Sunshine" probably is the fact that Tony Macauley produced the album, and Tony and Mike d'Abo wrote some songs together like "Build Me Up Buttercup". This album contains the Smith & d'Abo song "Free As A Bird". Rosetta Stone are: Damian McKee (guitar), Andy le Gear (guitar), Ian Mitchell (guitar)(he was a member of the Bay City Rollers), Colin McKee (bass) and Terry McKee (drums). The album was produced by Roger Greenaway and is as far as I know the only album by this band, however I do have some more singles by them. Theme From "If Loving Is Without You"
"A Broken Dream" is written by Smith & d'Abo and is also a track from their album. This album was very successful in Holland and stayed in the Dutch LP Tp 50 for 14 weeks and reached the 5th place. It was nice to see the lyrics included because they are not on the "Smith & d'Abo" album. Mike Smith told me that Manhattan Transfer recorded "Running Away From Love" on November 11, 1977, but it actually never got on a record.